NFL, NBA, College Football Handicapping Software from Sports Edge! If you've been looking for a fun and most importantly effective approach to sports handicapping then congratulations - you just found the right site. Leveraging the performance of your Windows based PC, Sports Edge! brings power and control to the individual handicapper putting you in control of your own destiny. Sports Edge! 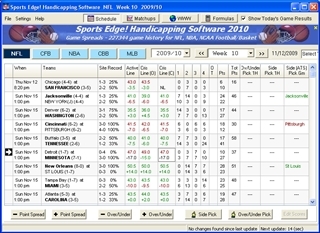 Handicapping Software is designed to be the primary information source for both serious and not-so-serious sports handicappers. As a powerful game matchup viewer, Sports Edge! provides the ability to analyze NFL, NCAA Football (CFB), NBA, NCAA Basketball (CBB) and MLB games games from a variety of different angles. In particular, 7 customizable game matchup screeens provide instant access to historical information that aids the handicapper in prediction analysis. Packed with over 300,000 games, Sports Edge! is the single biggest source of sports statistics for client-side applications available today. It is the first and only handicapping program that can access 5 sports from within a single program. Sport Edge! contains schedules, game scores, team stats, and game lines for 35 or more seasons for each sport (except CBB - 17 seasons). With real time scores and lines, Sports Edge! acts as the control center for your sports handicapping experience, keeping you constantly up to date and ending the need for a scattered approach to handicapping. Rather than provide (ineffective) automated selections, Sports Edge! instead provides a consistant, fast, ad-free environment for the handicapper to interact and analyze handicapping related information. With it's huge history of game and line data, you are able to customize various matchup screens and tweak settings in your search for value plays, games with an apparent statistical edge against the line. Much like a power tool, the results one achieves is dependent on the user. So this is not a quick pick system, instead it requires effort from the user in the form of practice handicapping and real-time game handicapping. That's not to say that you might not develop a quick approach to handicapping but be forewarned, this program is not for the lazy. Find out more on the main features of the 2017 version of Sports Edge!, by clicking here.